Online grocer Ocado and high-street retailer Marks & Spencer have announced plans to work together on a new joint venture. A series of “game-changing” medications combating a series of severe ailments have been approved for use in Scotland. A Moray woman diagnosed with multiple sclerosis will feature in a photography exhibition to highlight the loneliness and isolation of people living with the condition. 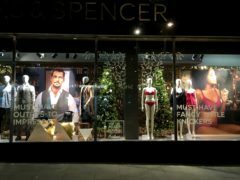 Model David Gandy has tweeted an ad showing him in underwear to poke fun at a story about Marks & Spencer being criticised over a lingerie display. At age 30, Gary Campbell’s body was failing him as the most brutal form of Multiple Sclerosis ravaged his system. A paralysed man has been left clinically depressed after his 24-hour care package was suddenly removed- leaving him “in pain, degradation and misery”. A determined Moray woman who suffers from multiple sclerosis has founded her own group to help fund research into combating the disease. Family and friends cooked up a feast at the top of Ben Nevis and raised more than £5,000 for the vital stem cell treatment needed for a Lochaber multiple sclerosis sufferer. Volunteers at a north-east charity were surprised with a special tea party from the families reliant on them as a way to say “thank you” for their hard work. An Aberdeenshire trio who met each other at a multiple sclerosis treatment centre hope their journey to Mexico for ground-breaking treatment will aid the fight against the disease. A wheelchair-bound MS sufferer has called for shorter bins after “inconsiderate” waste workers left hers out of reach. A north-east woman has launched a crowdfunding bid to help her undergo ground-breaking treatment. Bridge of Don shoppers will be able to stock up on delicious food and drink from M&S just in time for Christmas. A high street giant has confirmed a much-anticipated store will be opening in a suburban retail park next month. An 11-year-old boy from Inverness has run his first ever 5k to help support a charity close to his heart. A Moray supermarket had to be evacuated after a fridge caught fire in a storeroom. Oban's business community has welcomed a bid by retailer Marks and Spencer to create a store in the town. An Inverness man with a crippling illness has "deferred" his decision to end his own life at a Swiss clinic next month. On a good day Janet Maclaren is accepting of the cards she has been dealt in life, or as she likes to put it, "a really rotten hand" which she has no choice but to face. A north-east man has reached the finals of a prestigious national awards ceremony. Vivid, fresh green is the shade of 2017 and it's perfect for injecting some zest into your wardrobe.